It is proper to add that the labor of an Italian domestic servant is less than is usually expected of a servant in America. For one thing, there is no bread to make, which especially in a Southern family is an important item, where hot bread in loaves and other varieties of hot bread are prepared for breakfast. Storerooms are to some extent used in the north of Italy, but south of Florence, I think, hardly at all, and as regards most articles of consumption the supply is renewed day by day. From the baker comes bread every morning, and from the dairy milk morning and evening, both of excellent quality The ovens are what we call Dutch ovens, such as I have often seen in the valley of Virginia. A quick, hot fire of dry twigs and brushwood is made within; then the ashes are swept out, the loaves thrust in, the door closed, and the baking done by the accumulated heat. The marketing, which includes also the buying of groceries, is done by servants, though no market basket is used, but a large colored handkerchief kept for the purpose, just us Ruth filled her veil with the grain she had gleaned. 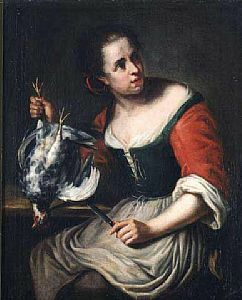 The cook returns to the kitchen, and what a number of articles does she produce from the hidden depths of the handkerchief and lays upon the table, such as meat for the soup, which is a constituent part of dinner among the Latins; then there is a stable or two, some herbs for seasoning, sugar, rice, some of the hundred species of macaroni, butter, fruit, all done up neatly in conical parcels of brown paper; in the case of delicate articles, lined with a large green leaf. Marketing is a perquisite much prized by servants. Where they are dishonest they add a few centimes to each article in making the daily account with the mistress. I have known servants who would even frankly say, ‘I want such and such wages, but if I do not make the expenses, I must have more’ for even when there is no dishonesty, servants enjoy a little commission or get presents from the shops where they habitually buy. It is also a pleasant break in the day to go out for an hour, linger in the sunshine, chat with one’s friends, or step for a few minutes into a church for purposes of devotion. Cooking stoves and ranges are not much used. In their stead are gratings set into square holes in a brick erection which is open also at the side. Into these holes, called fornelli, is placed charcoal, the one fuel used for cooking, the pots are set on top, the fire is kindled with reeds, and the cook uses a fan of turkey feathers as blower at the hole below. Who would suppose a dinner could be cooked thus? But facts are stubborn things. The utensils are of tinned copper or of earthenware. In the former case if the re-tinning is not done when necessary, poisoning results. One of the extra expenses of living in a furnished apartment is paying the landlord for the re-tinning of innumerable pots and pans, including those which, not having been used, neither need nor get it. Dinner, even when quite simple, is always served in courses. The use of wine at the table is universal, and deemed as necessary as bread, and more necessary than meat. Butter, which is never salted, is not so common a table article as among Anglo-Saxons. The French say that the English have a hundred religions and only one sauce. Tomatoes enter largely into Italian cookery as a seasoning, being preserved for the purpose. Macaroni, or pasta, made in the house with eggs and flour, both nutritive and easy of digestion, or risotto, often takes the place of soup, and is called a dry soup, but both a dry soup and broth are never served at the same meal. However plain the meal, the linen tablecloth and napkins, even if coarse, are ever clean. Eggs are sold neither by weight nor by the dozen, but so many for half a franc, the number varying according to size, all being supposed equally fresh; but for eggs laid the day of purchase you go to the creamery and pay three or four cents each, a luxury too dear for most. In purchasing by weight the old-fashioned libbra [sic] (Latin, libra) of twelve ounces may be used, but a more exact weight may be secured by using the modern kilogram (chilogram), which is a thousand grammes, or some of its multiples. Wood is brought ready sawed, or the sawing is done at your door, generally without a horse, the saw being held stationary between the knees and the log of wood worked against it. The handsaw resembles our woodsaw, only smaller. The chief repast of the day is usually in the evening, sometimes late at night, when work and business are over and there is leisure to linger at the board and season its viands with the feast of reason and the flow of soul ; then, however simple the food and sour the wine, family and social converse adds an unmistakable charm. America is the blessed land of abundance, with many a gastronomic capital, but in Italy dining is one of the fine arts.